Mid-Autumn Festival (中秋节) is another few weeks away, but it's never too early to start the celebration with yummy mooncakes! Falling on the 15th day of the 8th lunar month when the moon is at its roundest, mid-autumn is traditionally a night where family members gather to appreciate the bright full moon while enjoying delectable mooncakes, a delicacy which has since became synonymous with the festival. 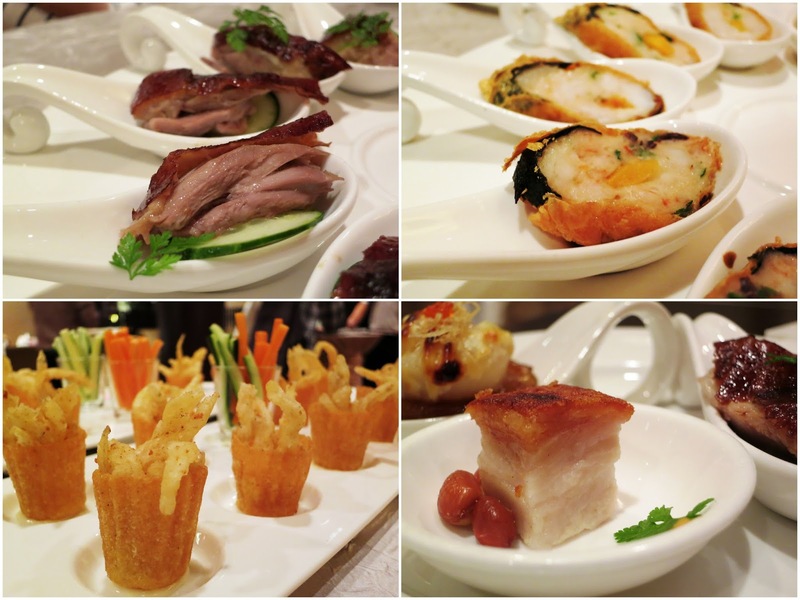 This year, Holiday Inn Atrium's Xin Cuisine Chinese Restaurant unveiled an array of striking new creations along with their best-selling signature flavors, and brought us an evening of mooncake appreciation with wine pairing, an idea which I thought to be rather unconventional but totally ingenious. Helmed by Chef Cheung Kin Nam who has over 30 years of experience crafting delicate dim sum and pastries, Xin Cuisine's range of delectable mooncakes "promises to delight with its brilliance like the brightest moon that adorns the darkest night". The snowskin range certainly dazzled with their cheery colors. Presented in equally vibrant colored mooncake bags to match, and a limited edition premium box which include a bottle of wine, they make wonderful gifts this season. For the contemporary snowskin range ($50/6pcs), the diversity in flavors are celebrated in novelty offerings of Green Tea Paste with Chivas Chocolate, Soursop & Chocolate Crunch, Champagne Chocolate & Pandan Lotus Paste, Passion Fruit Paste, Black Sesame Paste with Peanut & Chocolate and Peranakan Durian. My personal favorite has to be the Green Tea Lotus Paste with Chivas Chocolate, which is one of the newly launched flavors this year. What's not to like about the velvety smooth lotus paste laced with a delicate green tea aroma, intertwined with bursts of rich whisky ganache, a combination which works undeniably well. The Champagne Chocolate & Pandan Lotus Paste mooncake is heavily perfumed with a strong pandan flavor which is a tad overwhelming but still resonate with my tastebud simply because of my adoration for anything pandan. Smelling distinctively robust is the Peranakan Durian, which rivals real durians in terms of pungency. It sent me scurrying away, but binds the durian lovers with its lingering taste. I also tasted Xin's Cuisine best seller and award winning Mini Special Egg Custard with Egg Yolk Mooncake ($52/6pcs). Very rich with a smooth creamy custard well balanced by the saltiness of the egg yolk, it's no surprise why this signature creature is a perennial favorite of many. The traditionalist in me can never say 'no' to the classic White Lotus Seed Paste with Double Egg Yolk Mooncake ($56/4pcs). It never fails to satisfy, especially when the sweetness is very subtle. Yam lovers will enjoy the flaky crust and flavorful textures of Teochew Yam Paste with Single Egg Yolk ($52/4pcs). An interesting mention is the new XO Sauce with Assorted Nuts Mooncake ($56/4pcs). Savory with a tinge of spiciness from the XO sauce, the taste is very much an acquired one, but not at all unpleasant. The medley of nuts provided a crunchy texture which differs greatly from the usual smooth lotus paste based mooncakes. Unusual layers of textures and flavors but I still prefer a baked double yolk anytime. We were encouraged to be adventurous in pairing the wines with mooncakes, although general advice is to pair the red with traditional baked mooncakes, and white with the snowskin ones. Time for some experimentalism! But alas, I don't drink. Many thanks to OpenRice for the invitation and Holiday Inn Atrium for hosting. Mooncakes are available until September 19, 2013. For enquiries, please call Xin Cuisine at +65 6731 7173. Xin Cuisine is having an exclusive 30% off their mooncakes when you quote “OpenRice Mooncake Promotion” (valid for the first 100 boxes until 30 Aug only). Do check out their website for more details.